When riding your Harley Davidson motorcycle in a group here in Louisiana, we must do it in a way that does not endanger anyone or interfere with the flow of traffic. Louisiana Harley Riders wanted to provide some general rules followed by motorcyclists touring in a group. These rules are not difficult. As a rider, you must understand that you are responsible for the safe operation of your bike so that you do not endanger yourself, your passenger, or other vehicles on the road. All your driving maneuvers should be thought out, planned in advance, and communicated to the other members in the group. Never take a spontaneous action unless necessary to avoid injury. be as informal as standing around in a parking lot or as a special meeting to hand out maps and cell phone numbers. 3. Ride your own ride, and don't go any faster than you feel comfortable going. Remember that riding in a group does not mean you surrender any decision making when it comes to your safety. 4. While riding, don't fixate on the motorcycle in front of you. Instead, remember your basic training. Look well through the turn to where you want to go. If you want to see what’s going on, look 5 bikes ahead of you. 5. All riders are responsible for making sure their motorcycles are mechanically up to the task. Before you even meet up with the group, make sure you've got plenty of fuel in the tank, and you've taken care of all those maintenance issues. You really don't want to be the reason for stopping the group for something mechanical you could have prevented. 6. When crossing controlled intersections, motorcycles should pair up to reduce the length of time crossing and keep the motorcycles together. This should avoid anyone trying to play "catch up." Each rider is responsible to insure they can make a safe crossing before entering the intersection. 7. Each rider should observe, and constantly be aware of, the motorcycle in front and behind, to be on the alert for any trouble. Trouble can arrive quickly - you should be paying close attention. Maintain the following formation for normal group riding. On narrow roads, curvy, or mountainous roads areas where visibility is limited, construction areas, loose surfaces, or when there is an obstacle in the roadway, ride single file. 8. Adjust your lane position to deal with hazards and invasions of your space cushion. Use at least 2-second spacing when riding single file, such as in twisty sections. Above all, ride carefully. Common courtesy while sharing the road is important. 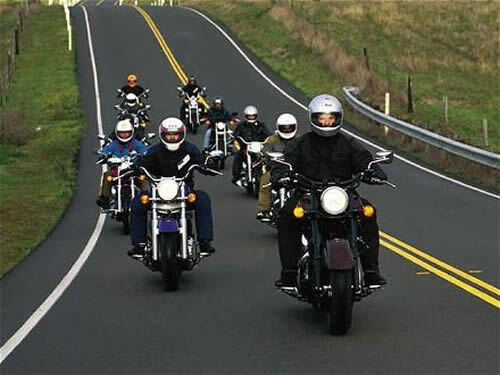 RIDERS PASSING ON THE RIGHT, WEAVING THROUGH GROUPS OF RIDERS, TAILGATING, OR OTHERWISE RIDING IRRESPONSIBLY, ARE ENDANGERING THE OTHER RIDERS AND ARE NOT WELCOME ON GROUP RIDES! 9. On the road, motorcyclists should have at least a 2-second cushion in front and behind them, except when stopping at controlled intersections. Leave enough room per lane so each rider can maneuver side-to-side if need be. Street lanes can be split up into 3 equal sections (this is learned at the DMV when obtaining your license). The left 'tire track' is 1, the oil stained strip is 2, and the right 'tire track' is the 3rd. Always travel in the left or right sections; avoid the oil strip when possible. Always ride in a staggered position! 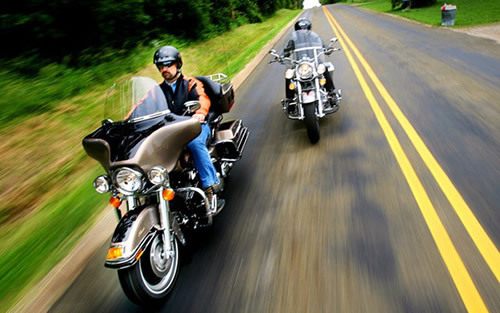 Avoid riding side-by-side, it’s extremely dangerous and you’ll have no exit strategy in case of accident or hazard! These are rough guidelines for a successful group ride. Every group has their own objective, style, and personality. Some groups RIP up the canyon, some sit back and Cruise. Be sure you know the overall speed and expectations of that particular ride. Take these ideas and adapt them to make them work for you. 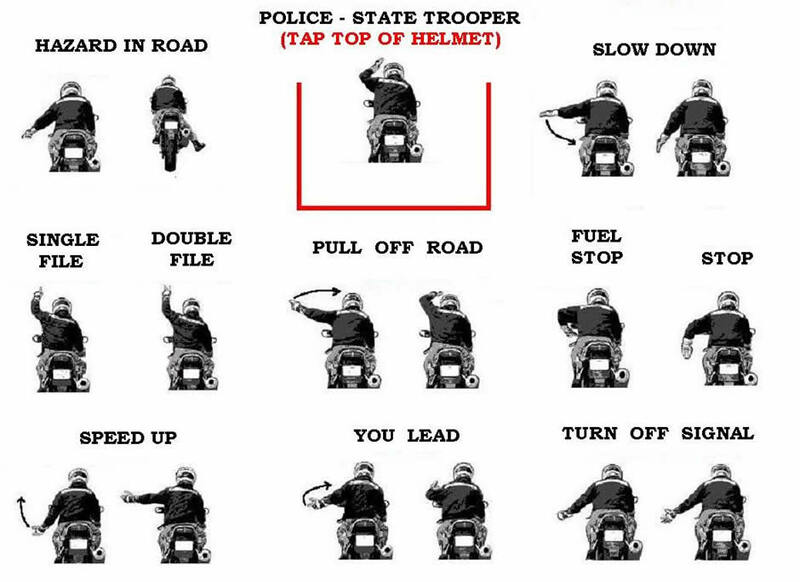 These tips are osted by Louisiana Harley Riders to help ensure everyones saftey. Some groups have highly-structured and well-thought-out rules for group riding, using road captains, sweep riders, a set order, and numerous hand signals. These are a sample of commonly used hand signals. Hope this information was helpful to making your riding more enjoyable and safe. Special thanks to the Motorcylce Safety Foundation and AMA-cycling.org for the informaition provided.